A vacuum pump is a device used to remove air, gas or vapor from a container and seal a vacuum inside. It is a valuable equipment in many industries and is used for a plethora of applications. But, before it was accepted as an essential tool of today, vacuum pumps used to be synonymous with high energy costs, excessive noise, and high maintenance requirements. Fortunately, it has undergone a fast-paced evolution to become one of the most reliable and cost-effective solutions to the needs of various industries. Today, there’s hardly any industry that doesn’t rely on the benefits of having a vacuum pump in their system — and if you’re looking to explore the use of this tool, you need to know exactly the purpose you want it to serve. 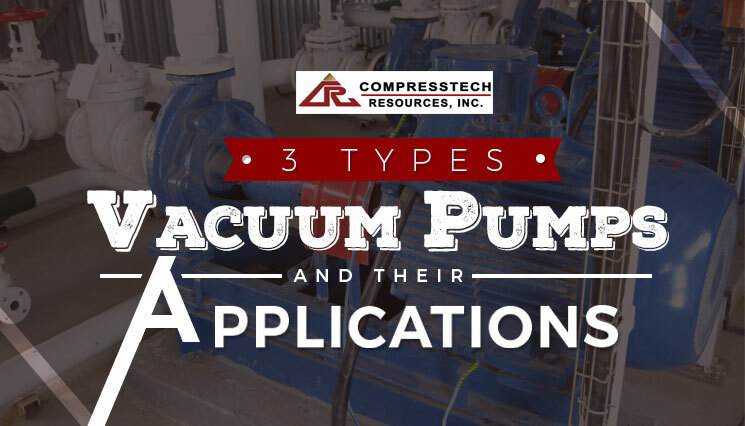 To help you with, Compresstech Resources Inc., a distributor of EVP vacuum pumps and other compressor equipment from other leading brands, listed three of the most common types of vacuum pumps according to their applications.